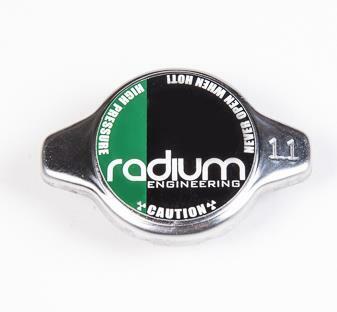 Radium high performance radiator caps are engineered to improve cooling efficiency. The radiator cap is an essential part of an upgraded cooling system and will help to safely maximize engine performance by controlling the coolant boiling point. Each OEM replacement radiator cap is manufactured from stamped stainless steel for durability and feature silicone sealing elements that are superior to natural rubber gaskets. Available in 3 pressure ratings: 1.1Bar (16.0psi), 1.3Bar (18.9psi), and 1.5Bar (21.8psi). A higher radiator coolant pressure effectively raises the boiling temperature of the coolant, providing extra safety margin and preventing air pocket cavitation at the water pump. Also available in 2 common styles (Type-A and Type-B). Radium radiator caps are designed for mini size (32mm ID) radiator necks only.